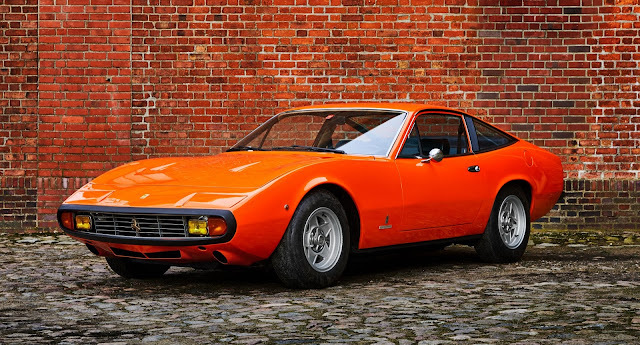 - The Ferrari 365 GTC/4 is a 2+2 sports car built by Ferrari from 1971 to 1973. Outwardly, the car vaguely resembled the 365 GTB/4 "Daytona", upon which it was based and with which it shared a number of components. The 365 GTC/4 has long stood in the shadow of the sensational Daytona, and has often been referred to as the forgotten Ferrari. It seems people fail to realise that, for the GTC/4, Ferrari took what was great about the Daytona, and built upon it. - - The chassis was retained, as was the 4.4-litre Colombo-designed V12, the latter of which was modified with wet-sump lubrication, new cylinder heads and six double flat-flow Webers, rather than the four downdraught carburettors in the Daytona. This allowed for the bonnet and the sloping nose of the car to be lower. At 340bhp, power was slightly less than that of the Daytona for the sake of tractability, and the five-speed gearbox was mounted directly onto the engine rather than at the rear axle. The transmission towered into the cockpit, explaining the tall and wide centre console. Coupled with an engine that was mounted as far back as possible, this meant that a substantial portion of the car´s weight was concentrated in the middle, resulting in a 51:49 weight distribution, better than that of the Daytona. It also had independent suspension with double wishbones and a hydraulic self-levelling rear end. - - Collectors and enthusiasts alike have begun to catch on to the Ferrari´s excellent sporting and GT credentials, and for the last few years values of these cars has been steadily increasing. This stunning example is characterised by its ultra-rare factory orange colour. It´s been lovingly maintained by its previous owners, and boasts the Ferrari certificate of authenticity. - - Ferrari 365 GTC/4 Build date: 01.02.1972 Ferrari Certificato di Autenticità since 09.10.2013 Excellent condition, Over 20 years with the same owner 53,300km, Viewings gladly invited by appointment. Contact Hallier Classic Cars for more details.